Rich Tasks: What is it? A task that explicitly requires students to make sense of mathematics and to make connections between concepts, procedures, problem situations, representations and tools. Can be an open-ended problem, with a variety of possible solution paths that range from simple to complex. 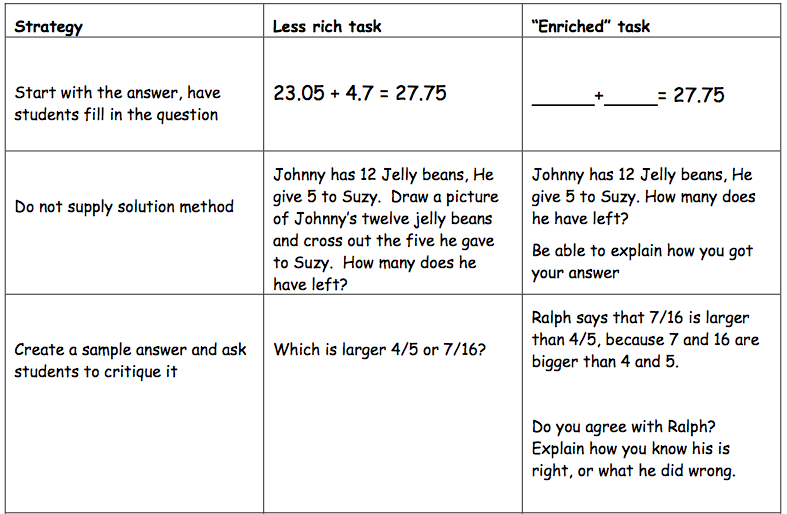 Can require justification, where students have to provide reasoning and evaluate the reasoning of others. Requires a culture of inquiry and persistence. Maintains academic rigor in your lessons because there are no obvious procedures to follow or “key words” to clue you into what operation to use. Thinking and application of concepts is required. Builds in differentiation: both proficient and less proficient students can be challenged and can show success because everyone has access and students can journey very far down conceptual paths. Promotes academic talk between and among students because it provides important ideas to wrap one’s mind around and promotes the capacity to construct a mathematical argument. Is versatile:Some rich tasks can be used as quick warm up tasks, in independent practice or group work, as a Think-Pair-Share, as a main task or homework task or for assessment. Is a highly efficient method of assessment of students, either formally or informally and provides ample opportunities for students to represent their mathematical ideas using models and written language.